My name is Cristian Tambley and I am a Computers and Systems Engineer. I am actually working for CHEP, a huge logistics company where I develop and support information systems. I am invited this year again to join the project in charge of the "on field" logistics. This means to organize all the needs for all the people (spanish and english speakers) that will stay, work and climb in the Licancabur volcano and the surrounding areas. 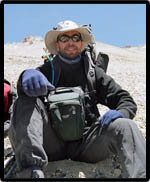 I have organized sport mountain climbing expeditions several times, but these expeditions have had been quite different because the goal is scientific. Just think the needs of about 20 people who will stay and work in an extreme environment as the Licancabur area: nutrition, altitude, temperature, inherent danger while climbing, altitude psychology and difficulties of working with people with different languages. 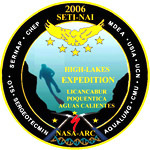 The team will stay at the base camp at 4300 meters high and then will go up to the summit at almost 6000 meters high. We have to eat, sleep, work and swim!! in really hard conditions: about -30¼C with winds of 60 km/h. The only way to do this is working as a team of friends with a happy and safe attitude. Although Computer Engineering can be not considered very scientific, you can do a lot of work together with the scientists. I always wanted to know more about everything, so I began to researching technology very young. I like computers and challenges, so I will go soon for my post degrees. To travel and to watch quality television is always a source of information, and it can help you to open your mind. For me, watching and reading about astronauts and spaceships is enough to keep a child dream alive for many years. I practice a lot of sports: mountain bike, kayak, and mountaineering. I love to be surrounded by nature. I also like robotics and electronics, these are hobbies now, but I want to make a career in these areas.